If you want a poster child for everything that’s wrong with government in the Golden State, take a look at the California Citizens Compensation Commission, a body that manages to combine lawlessness and unaccountability in equal measures. Created by Proposition 112, a constitutional amendment passed by the legislature and approved by voters in 1990, the commission has a single task: to set salaries and benefits for state legislators and constitutional officers. There is, of course, no more touchy political question than how much politicians should get paid for doing the public’s work. It’s an issue perfect for demagoguery. Except the seven people on the commission are in no way like the rest of us. Appointed by the governor to six-year terms, they are not subject to confirmation, and they are accountable to no one. They can do what they like and nobody else has a say. 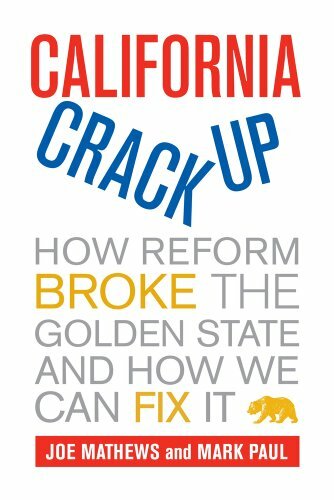 Can we fix the California Crackup using "clean money"? That's one of the questions Joe Mathews and I have been asked most frequently as we've talked around the state in the last year. Our answer, based on anecdotal evidence from Arizona, has been "no." Now there's evidence to back up our impressions. Feeling unrepresented by the Legislature? Writing at Townhall, Paul Jacob says there is a good reason you feel that way: you are in fact underrepresented. He makes the case for smaller legislative districts. “Actually meeting with constituents might be a good thing for the democratic system,” Seth Masket notes. Such good things are simply impossible in California, where our legislature was sized in 1879 for a state of 600,000 people to have Senate districts of 15,000 people.